Last year, on my birthday, I accidently discovered that Ben Sollee and Daniel Martin Moore were playing an in-store at ear x-tacy as part of their release of Dear Companion (the #1 selling cd at ear X-tacy in 2010!). At that point, I had just started listening to Ben Sollee and was excited about seeing him live…especially on my birthday!! He has such a unique way of playing the cello…and his voice just warms a room. I quickly became a full-fledged fan after that show. They were mesmerizing and so talented! Not only did I become a huge fan, but L, my 2.5 year old (at the time), also became a fan and frequently requested “Ben Sowwee”. Fast forward to the summer and HullabaLOU. My dear friends were joining us on the Saturday to see Kenny Chesney on the main stage. However, I wanted to make sure to get there early enough to see Ben Sollee on one of the other stages. My friends were happy to tag along and quickly became fans of Ben as well. I sent them his cds Learning to Bend and Dear Companion. My friends are a military family and while we have enjoyed having them living within 2 hours of us, it is time for them to move onto their next city. They mentioned to me that one of the things on their list to do before they move was see Ben Sollee perform live again. I let them know that I would keep my eyes open for shows. We walked in the door and I looked to my left and saw none other than Ben Sollee standing right next to me! I went over and introduced myself and told him how much I liked his work. His friend graciously took our picture and we went separate ways. A little while later, hubby and I settled in upstairs, near the rail. We had a great view of the stage. At some point, I saw Ben Sollee and his 3 year old son standing not far from us. I went over and started talking to them. I was struck at how humble and down to earth Ben was. I decided it was now or never and I told him of friends’ wishes to see him live again. I asked if would consider playing a house show for them. He said absolutely and I was ecstatic! But that isn’t the end of the story at Headliners. As I said, hubby and I had a great viewing spot that night. As the show started, we noticed a photographer, Kory Johnson, trying to get a good shot. We offered to let him jump in our spot for a few shots and told him he could do it all night. He was very appreciative and said he owed us. I told him that if we worked out the details of the house party with Ben Sollee, then I wanted him to photograph the events. Without hesitation, Kory immediately agreed. That was a special night that lead to the magically night of Feb.25, 2011. 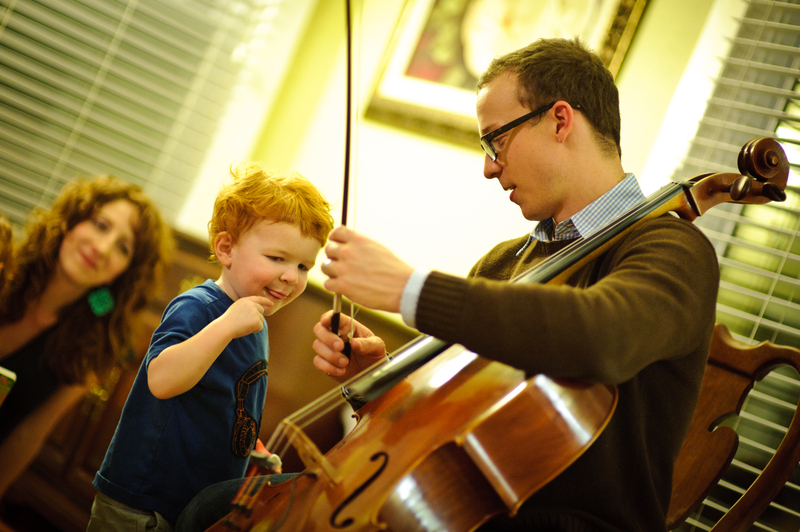 We were expecting an intimate group of about 35 friends and family…all fans of Ben Sollee…plus about 10 kids. My little rocker was out of his mind excited. Every person we saw in the days leading up to the house show, he made sure they knew that “Ben Sowwee” was going to play at our house! Kory was still on board with photographing the event…a huge blessing so that I could enjoy the event fully and have beautiful documentation of the night. We were all excited but not sure what to expect. I can tell you, though, I did not expect Ben Sollee to sit down and play Hungry, Hungry Hippo with my kids and God-daughter. I did not expect Ben Sollee, his wife and son to fit into our party like we had all been friends forever. I did not expect L to share his instruments, especially his drum (that he doesn’t share with anyone!!) with Ben Sollee’s son. Ben’s music speaks for itself and is always beautiful. He was entertaining, warm and humble. But the real magic of the night happened when he was so welcoming with the kids in the group. It helped that his son was dancing around, asking his Dad to ‘play louder’! My little guy sat back and watched for the start of the show. He was very comfortable in my lap. But, then his curiosity took over. He ran up to give Ben Sollee a hug between songs, and then he started barely touching the cello strings. Ben could have told him to stop and not touch at that point, but he didn’t. Instead, he showed L how to use the bow and let him try. He also told L to place his hand on the cello to feel the vibrations while Ben played. My son was absolutely in heaven. And I will always be thankful to Ben for encouraging his musical curiosity. It gives me chills and brings tears to my eyes when I look at the pictures Kory took of those special exchanges. I am so glad we could share incredible music with our amazing friends. They are a very special family and I have learned a lot about the sacrifices a military family must make. There is nothing we could give them to make up for everything they give up for our country, but I hope that Friday night brought them some happiness.